A special event honoring U.S. service members who have served in Japan and their family members will take place on Friday, Sept. 4, from 2 p.m. to 4:30 p.m. at the National Naval Aviation Museum in Pensacola. The Japan U.S. Military Program (JUMP) connects past and present service members, families, and government civilians who have served in Japan. Sponsored by the Sasakawa Peace Foundation USA, JUMP is a collaborative effort with the Embassy of Japan in the United States and the National Association of Japan-America Societies. 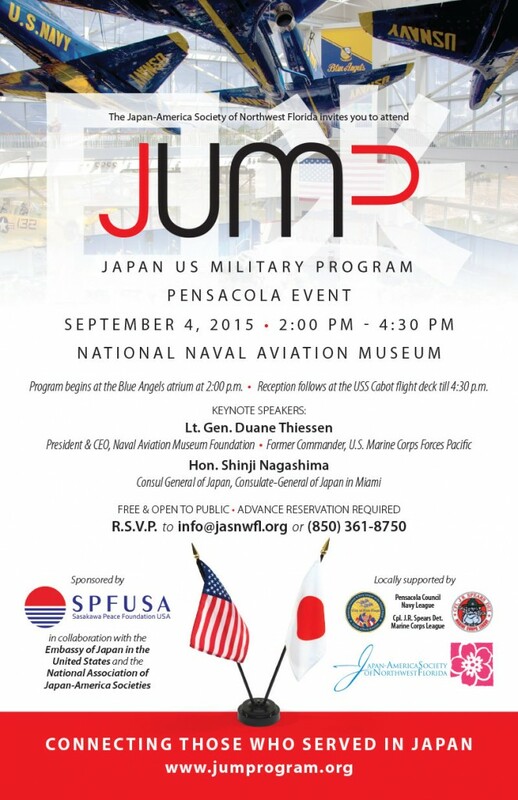 The JUMP Pensacola Event is being organized by the Japan-America Society of Northwest Florida, and local sponsors include the Pensacola Council Navy League and the Cpl. J.R. Spears Det. Marine Corps League. Featured speakers will include Lt. Gen. Duane Thiessen, past commander of the United States Marine Corps Forces Pacific and current president and CEO of the Naval Aviation Museum Foundation, and the honorable Shinji Nagashima, Consul General of the Consulate-General of Japan in Miami. Following the program, which will take place in the museum’s Blue Angels atrium, a reception will be held on the USS Cabot flight deck inside the museum. The program is free and open to the public, but advance reservations are required. If you would like to attend, RSVP by emailing info@jasnwfl.org or calling (850) 361-8750.